"Calvados is an apple brandy that is made only in the Normandy region of France. This simple but elegant dish can be made with Apple Jack or any apple brandy of your choice. I serve it with a wild rice blend or rice pilaf with almonds." Combine flour and seasoned salt in a wide, shallow dish. Coat the chicken breasts in the seasoned flour. Heat the butter in a large skillet over medium-high heat. Brown chicken in the butter, about 3 minutes on each side. Transfer chicken to a plate and tent with foil. 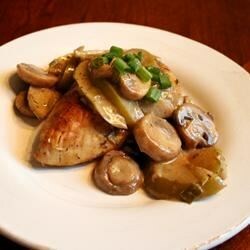 Combine the onions, mushrooms, and apples in the skillet. Cook and stir until the apples are just tender, about 5 minutes. Stir in the brandy, thyme, salt, and pepper; bring to a simmer. Return chicken to the pan; cook, uncovered, about 10 minutes. Stir in cream, and simmer until thickened, about 5 minutes. See how to make a classic chicken dish with a tart lemon-butter sauce. Absolutely loved it! A good hot weather dish. I made it as written and served the apples and onions on the side with buttered rice. This will be a company meal for me. I followed the recipe exactly and it was very disappointing. Thank you for trying my recipe and for your reviews. This recipe is amazingly easy, yet it looks and tastes elegant. I serve it for company and it always impresses!